Don't read this if you have anything important to do today. Back in the early days of my personal gaming odyssey, Bomberman was all kinds of awesome. So when a completely unofficial massively multiplayer version popped up on my Twitter feed, I nearly fell out of my chair. 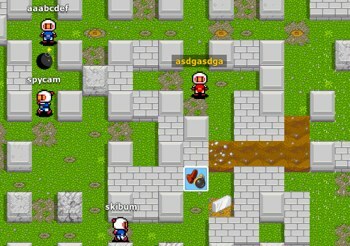 Bombermine pits you against hundreds of other online players in a what appears to be an endless Bomberman-esque level, complete with all manner of destructible materials, powerups, and, of course, bombs. The game plays exactly like a traditional Bomberman title but taken to a massive scale. There are a handful of servers currently up and the game runs entirely on your web browser using HTML 5. There are even leaderboards and in-game chat. Each server is built to handle as many as 1,000 players. Powerups range from speed boosts to weapon enhancements and character skins. You can focus on finding goodies or simply spawn in and attempt to bomb every other player you see. In my own play session, the game played extremely smooth, with nary a sign of lag or hiccups. If you have some time to kill, it's quite an addictive experience.